When it comes to having a green Aesop, many films fail to properly present it without coming off as heavy-handed, and, or, over-simply portraying it. This is evident in films such as FernGully and, more recently, Avatar. However, these are masterfully avoided in Hayao Miyazaki’s masterpiece, Princess Mononoke, the greatest environmental film I have ever seen. The film revolves around the efforts of its protagonist, Ashitaka, a young prince from a small clan believed by the outside world to have been destroyed hundreds of years ago. Ashitaka is quickly established as a brave, selfless young man, with a disdain for violence and a respect for nature and spirituality. When a demon possessed boar passes on its curse to Ashitaka, he is forced to leave his village and seek a cure for his ailment, or face death. His travels ultimately bring him to a mining village, Iron Town, where he is welcomed by the townsfolk. Ashitaka returns the villagers warm behavior until he learns of the destruction they have caused in the nearby forests. The film is careful to ensure that you sympathize with the natives of Iron Town and grow to like them as Ashitaka does before it reveals their dark ambitions, painting them in both a positive and negative light, as real people are. The human disregard of the sanctity of nature has caused the gods of the forests -- the wolves, apes, and boars -- to take the offensive against them. 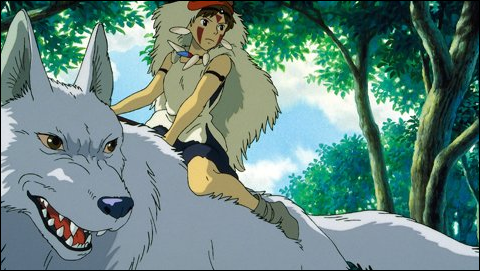 Amongst the wolves is a young human girl, San, known to the villagers as Princess Mononoke. She too hates humans for their abuse of the forest, and the film has a couple scenes that note San’s sensitivity when it comes to her own humanity, but this is not explored any further than necessary. Like the humans, the beasts are not portrayed as wholly good or evil. Their plight is an understandable one, but their modus operandi is arguably just as vile. Mononoke features Studio Ghibli’s signature gorgeous animation and awe-inducing soundtrack. The epic, sweeping score compliments the beautiful artwork and fluid animation, bringing feudal Japan to life, and making Ashitaka's quest all the grander in our eyes. The forests are equally bright and dark, colorful and bleak, creating a feeling of mystery and mysticism. The action here is swift and surprisingly brutal, without creating too jarring of a contrast with the rest of the world around it. The genius of Princess Mononoke lays in the true to life portrayal of the characters, themes, and the very world itself. All of the characters (save for Ashitaka, who acts as a neutral surrogate for the audience) have their imperfections and attributes that make them relatable. The acknowledgment of the fact that corruption and hatred is a double-edged sword is perfectly shown through the curse that plagues both man and beast, which acts as a metaphor just as much as it does a plot device. There is no black and white, and the movie does not answer any questions it raises. It presents the world as it is, and appropriately makes it as difficult as it in the real world to take a stance.